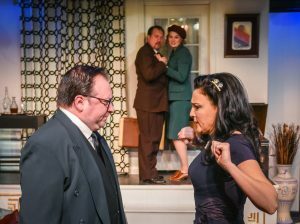 Cyrano’s Theatre Company is presenting Noel Coward’s classic Comedy of Manners, Private Lives about a divorced couple, now on honeymoons with their new spouses, who meet and discover that they are still attracted to each other. Director Teresa Pond and actors Frank Delaney and Stefanie Suydam drop by Stage Talk this week to talk about how this play is still as “fantastically funny” as it was back when it was first produced in 1930. Private Lives runs March 10 through April 2 at Cyrano’s Theatre Company. ORIGINAL BROADCAST: Friday, March 10, at 2:45 p.m. ORIGINAL BROADCAST: Friday, March 3, at 2:45 p.m.